I was inspired to begin blogging a couple of months ago after seeing Julie & Julia. I really liked the movie even though it was mostly about cooking (love to eat, can’t say I love to cook). I was looking for a way to support myself kayaking through the winter, and I thought if I blogged about it (with pictures) my motivation would be improved. I have to tell you the truth, I don’t think I’m much of a blogger (I promise I’ll try to get better), but I’ve sure read many inspirational blogs that were incredibly motivating. Make sure you check out all the one’s I follow. Most are fantastic! Now that my daughter’s in college and I find myself kayaking again, I began looking at these endurance races. I needed something manageable for the first race. No, the Yukon events were 400 to 1,000 miles. Watertribe was way in Florida. The Missouri 340 was a possibility; but longer than I thought I wanted to do. What if I hated it? There’s the Texas Water Safari. Not only long but pretty challenging as far as obstacles, etc. I found a few shorter events (than what I’m not sure), but too long of a drive for a few hours of paddling. Then I discovered the Colorado 100. One hundred miles sounded manageable. A class I river with no portages. Only have to drive 1/3 of the country to get there. Oh, did I mention it’s supposed to be HOT? So the CR100 it is. Registration was the 1st week of February, and I’m in. 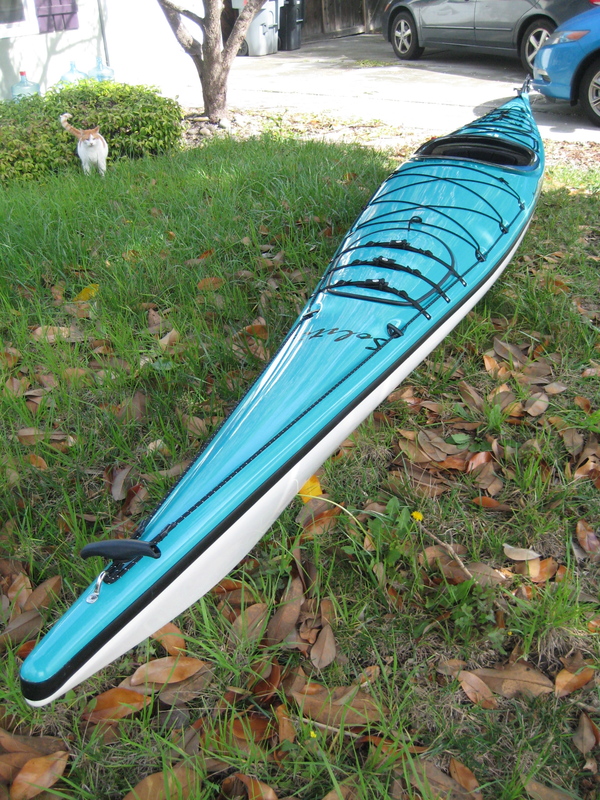 Since registration I’ve investigated boat outrigging, training, fueling and hydration, and oh, I bought a new kayak too! Here she is………. A Solstice GTS by Current Designs. I was really sold on the Ikumma made by Seda. Jake from Portage to Portage Project is using the Ikumma. It even fit me. But when I got in the Solstice, it was like coming home! I even splurged on kevlar (another way of saying I went into debt). We had our maiden voyage last weekend. Sweet! I fooled around in the Oakland estuary, just getting comfortable, and also worked some on my forward stroke. Had some help in the latter from a great guy from a local kayak store. We’ll be going out again this Thursday. The next couple of months I’ll be putting on some miles and working on technique. Also measuring out some training distances. Thank g_d I already have a GPS. The race website has a training page. Take a look and give me some feedback if you’d like. I’m going to try to follow it as much as possible. I’ve never paddled some of the recommended distances locally. So, presumably I’ll be discovering my local digs too. This entry was posted on March 7, 2010 by DummyDiva. It was filed under Uncategorized and was tagged with athletics, blogging, Colorado 100, Julie&Julia, kayaking, outdoors, paddling, sports, ultra marathon kayak/canoe.